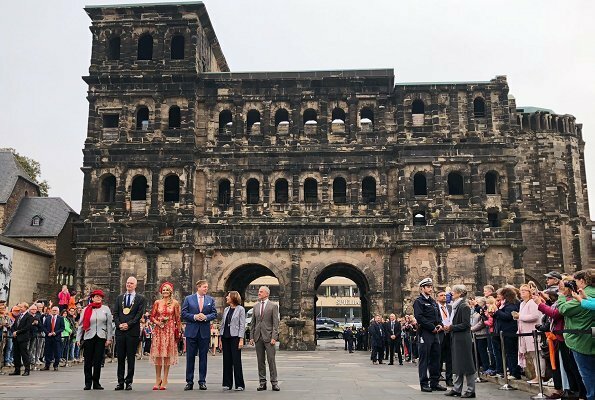 On the second day of their 3 day working visit to Germany, King Willem-Alexander and Queen Máxima arrived at Porta Nigra in Trier. The city gate, which dates from Roman times, is the symbol of Trier. 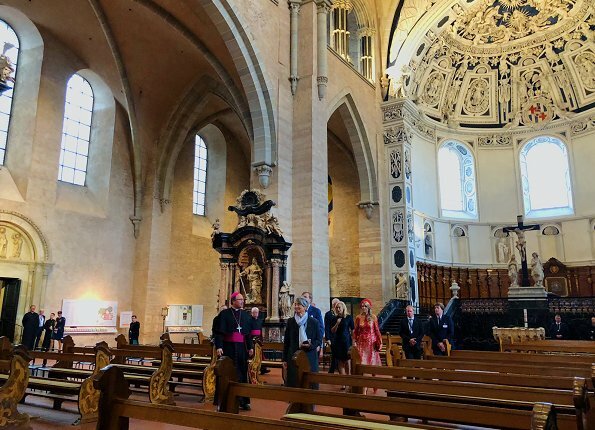 Then, the King and Queen visited the Cathedral of St Peter and Church of Our Lady. In 2018 Trier is celebrating the bicentenary of Karl Marx, who was born in the city in 1818. 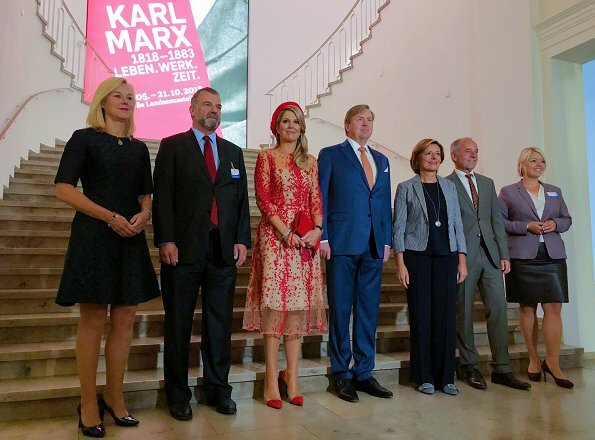 The royal couple visited an exhibition on the life and work of Marx at the Trier Landesmuseum. Marx developed his ideas in the nineteenth century at the time heavy industry was developing. another Maxima look! I don't like it. Overlay is too long. Looks sloppy. Otherwise fine dress. Queen looks beautiful but appears overdressed for the occasion compared to the ladies around her. Ich mag Maximas Herangehens/Sichtweise an ihre Rolle. Es gibt immer etwas zu Gucken und Staunen und Amüsieren. Langweilig ist es nie. Sie könnte natürlich einen superedlen Businesslook wählen, in gedeckten Farben und ganz comme il faut. Mir gefällt dies besser. Es ist ein offizieller Besuch und da kleidet Königin sich halt so. Jedenfalls in Holland. 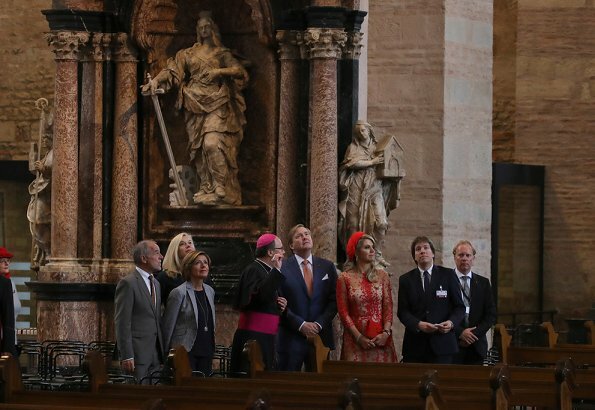 Schon ihre Vorgängerinnen hatten ihren ganz eigenen Modegeschmack. Maxima profitiert noch heute davon (Schmuck) und drückt dieser Tradition ihren eigenen Stempel auf. Die Haare sehen wunderschön zum Turban aus. Máxima looks beautiful! I love every detail of her outfit. The dress is magnificent, so she kept the jewelry simple. Absolutely amazing, this hair at one side with the red hat. Really like her special dress with two layers, especially when you at the profile sideways. The overlay should be shortened to an inch maximum below the hemline of the dress I think. Maxima's hair is gorgeous this way although it is fake hair. 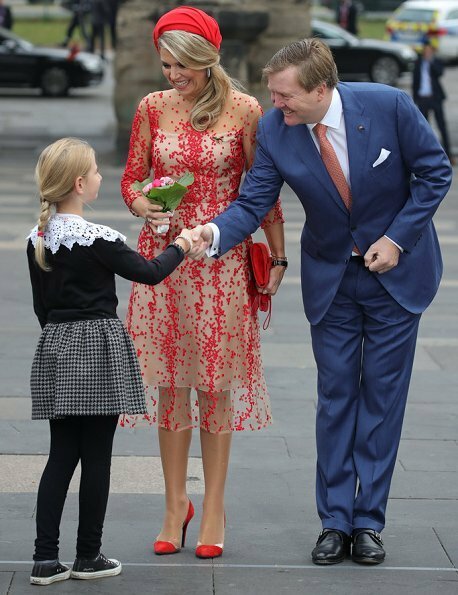 I do not think she is overdressed on this occasion, she is the Queen after all. Don't like the dress and hat. But love her beautiful hairdo. Sie sieht ganz toll aus! Die Haare sind super. BRAVO! 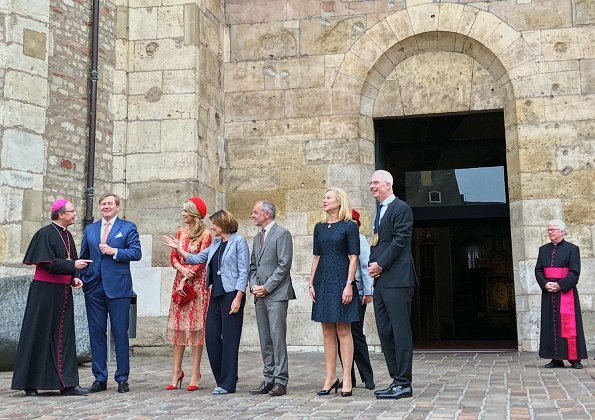 Love Maxima and Willem Alexanders visit to the Historic City of Trier. Both look great. Hope they have a good time there. Maxima looks very good here. Her hair is great, her hat is perfect. There are a few comments above that the top layer of the dress should be shortened. I disagree. I think it is fine. The only thing that I could fault is that this is not really a day dress, and she is over-dressed compared to the other women in her company. 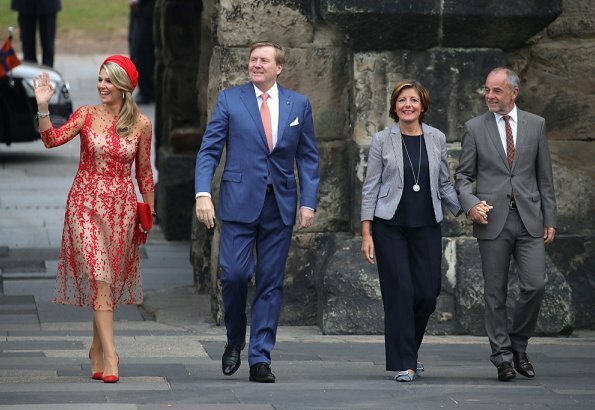 Maxima looks good and she is not doing it over this time, this is state visit and she is queen. Her hair is lovely here (with extensions). She looks wonderful - love the dress, the hat and her hair looks lovely styled like this. She looks very good - but she is always overdressed. She visits a factory in a dress that others would wear to go to a wedding.